It seems like the season for finishing in so many of our lives, especially if you are a mom or a student. Finishing classes, graduating from school, finishing jobs, finishing homeschooling your kids, finishing sports, finishing athletic seasons. And you know what...I look around and I see weariness, weariness in myself and in others. Question is do we have enough? Do we have enough to finish strong? Do we trust God with this last bit of the race? When circumstances seem impossible, do we press through to the finish? My girl recently completed her first year of college. I am so over the moon proud of her. It wasn’t an easy year on so many levels. In fact, I advised her to just drop one class because the parameters around finishing successfully, along with all of her other responsibilities, seemed impossible. She didn’t drop the class. She hung in there. She did her best and trusted the end results to God. When she came home for a short break before going back to summer school, she said, “You know what mom? I learned something about myself. I am a finisher.” I could have cried. Oh how my kids teach encourage me every day! You see when my daughter would run cross country or track races in High School injured, she knew she wouldn’t do well from a competitive perspective. It discouraged her. I would tell her the goal is to just finish, be brave, God’s got you, give him honor on that course that’s all he asks. She would do it and I would silently pray, God why, why is this so hard. All the kid wants to do is run and You are making it so hard. My mommy heart broke into a million pieces. But you know what, when she sat at my kitchen table and said, “I am a finisher,” I thanked God for those hard times and not just in running, in relationships, in school work, in illness. ALL those times made her strong and gave her faith to finish no matter the results because she has faith that God is always working on a bigger picture --- ALWAYS. He is continually working on the big race and preparing His people to run and make a difference. Hard things prepare us. They make us stronger. They fill us with faith that He is faithful. They give us the history to speak into the lives of others from a place of knowing how hard things can get. They shape us. They develop character that can’t be shaken. Hard things bring gifts that otherwise cannot be given. And when we have God in our lives, we don’t have to walk hard stuff alone. We can draw on Him, lean in with all we’ve got and He will help us finish the race one step at a time. As with most entries in my journaling Bible, this entry reflects my journey and the journey of those I love. I doodled this little turtle in my planner one day and decided she needed a permanent place in my Bible so here she is! I washi taped my page to the mat so it wouldn’t move. Next, I outlined the turtle with my Illustrated Faith .65 pen and thought about colors. I pulled the Bella Blvd She Blooms collection out and decided to draw inspiration from the colors in the papers. Watercolors are next! Remember layers of watercolor are the key to rich saturated color. I used a blue Prismacolor pencil for some areas because I wanted some of the colors to be more childlike and soft. I added some details to my dear turtle’s skirt with a white gel pen -- because she’s a girl of course and frills just suit her! Now, here’s where I went a bit overboard. I painted flowers inspired by the paper on the top left corner. Sometimes I get lost in creating and have a hard time stopping. If you feel like maybe you should stop, take a break, walk away. Eat a bit of chocolate, run around the block (because you ate chocolate) then come back and look at the page with fresh perspective and then decide. Ha! Now I just need to take my own advice!!!! Anyway, once I had painted the flowers I was unhappy. Been there a million times. Push through...finish the race! I went back to my inspiration stash and started adding more!!!! Go figure. As with so many pages, the end result holds so many truths and it’s putting truth into my heart and mind I am after -- translation, good race. I am saying a prayer for you right now that our Lord will give you encouragement to take just the next step today. I pray that He will envelope you in His grace and empower you with His strength to finish the race. I pray that everyday you lean into Him and that He gives you moments when you can know without a doubt He is with you. I have had this giraffe on my heart for a long time. The Lord used the tall, graceful animal as a picture to remind me to keep my head and heart above the circumstances around me. To focus on Him. To keep my heart, eyes, and mind from wandering away from His truth. At first I was a bit intimidated to draw a giraffe. I had never drawn one before so I spent time looking at giraffes and doodling full body giraffes. I finally settled on just drawing the from the neck up. I thought this was a better representation of seeking what is above. I sketched out the giraffe in my doodle book and outlined the sketch in black. I made her a girl with beautiful eyelashes, well, because. There is an illustration on the other side of the page so I lightly covered the margin area with white gesso because I didn’t want anything to distract from the giraffe. Once that was complete, I used carbon paper to transfer my image to the page. Normally I would trace the image from behind but the gesso and the flowers on the next page would have made that difficult. Once the light sketch was on the page, I penciled in the other areas. Then I got stuck. I was already left with the navy washi tape so I needed to include blue. I knew I wanted a wonky, imaginative giraffe but I just could not settle on a color scheme. So I Googled “navy color scheme.” Violla. Ideas galore. Next I used my Illustrated Faith .65 and .35 pens to go over my pencil marks and then I erased any stray marks. I was inspired by the lines in my leaves to make lines and marks inside the giraffe. Like a funky quilt. Oh my... so me. There may be some more animals coming like this. Happy with the initial design, I pulled out the watercolors and began layering color. A tip I love is to mix colors on a clear sheet of plexiglass (you can get these in various sizes at Lowes). I put the plexiglass on top of whatever color paper I am painting on so I can get a true idea of the color. Watercolors look different on a cream background than on white and the plexiglass gives a delightfully smooth, flat surface to play with colors. Set your minds on things that are above not things that are on earth. Hugs my friends! You are Loved! So, a creative heart…..I believe we all have one. Some of us may have more fire inside to create than others but all of us have a bit of God’s design woven into our souls. Whatever gift of creativity God has entrusted to you, it is exactly that. It is a gift entrusted to YOU. He has sewn it into your soul trusting that you will follow the path and use it. He gave it to you so you could shine for Him and share a bit of who He is with the world. To make things beautiful. To build up and draw others to Him. Oh my. When I completed Day 9 of the Created to Create Devotional, I felt God press upon me the blessing of creating and the stretching and trust it takes to really create for Him. I love that Shanna Noel’s first order to address on this day was: perfectionism. It has no place in the creative process. If you are seeking perfection, stop. Perfectionism feeds fear and keeps growth and new ideas from happening. I heard a quote once, “being perfect is God’s business, not ours.” The greatest strength of a creative person is they are not limited. They do not think inside a box. They think outside the box. They let messes happen. They take risks. They are learners and they embrace the process of moving through creating. They trust God with the journey! Shanna writes, “give yourself permission to be messy, be free, make mistakes, and have fun!” Whoopie! Enemies often have friends and the friend of perfectionism is comparison. Comparison kills joy. Comparison is one of the gateways used by our enemy to feed the feeling we need to be perfect. Friends, it has no place in our creative hearts. Each of us see things in a unique way. We create uniquely. It’s by His design that we are different. We should be dancing a jig in our differences and lifting others when we see them shine. Comparison robs us of being uniquely ourselves and it divides creatives from each other. It’s an all around thief. So, if you struggle with perfectionism, and maybe comparison, what do you do? Bring God into the creative process. Ask Him for courage to trust Him and let Him teach you something new! Grow with Him. Create with Him and not on your own. Watch and see what He does. I think He will blow you away with His creativity and His desire to create with you.Next step. 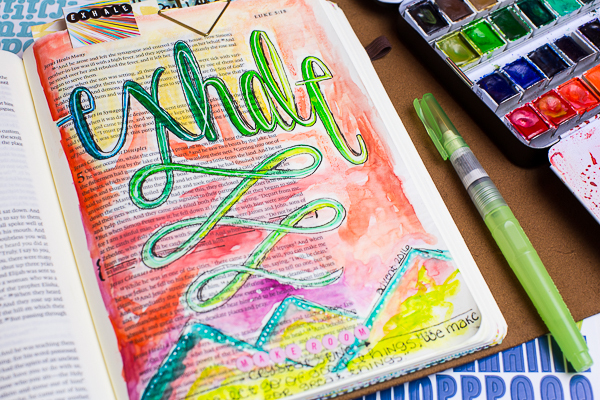 You can “color” anywhere, in your Journaling Bible, an art journal, or the Illustrated Faith Praise Book. If you are a gardener, dig in the dirt! If you are a writer, write it out. If you love paints, paint. If you love paper, use paper pieces and stickers. Wherever God is calling you to be creative, CREATE. Use what you have and enter into the creative process. And God will smile because you are doing exactly what He designed you to do! Last step. REPEAT. Oh this is where we sometimes miss the boat. Creating should never end. It should go on and on and it should be shared. Sometimes even the “ugly” stuff should be shared so that others can find courage to jump in the creative boat too. After all, the art we create all belongs to Him. Remember, it is a gift from Him. It makes Him SMILE when His children use the gifts He has entrusted to them. PRAY, COLOR, REPEAT my friends. I can’t wait to see what He creates with you and through you --- it’s all so beautiful to Him! First order for me is to sort lies from truth. And not just sort them, call them out so I can begin to believe and act on truth. For some reason this is easy for me over other people’s lives. I joke that I have butterfly eyes. When others are frustrated with someone, I am the one who “sees” potential for beauty and goodness. A student can tell me his is just “lazy” and I can look him straight in the eye and with 100 percent of all of my heart, mind, and soul tell that precious young man, “NO, that is a lie from the enemy. You can choose to believe the lie and choose to be lazy OR you can do something radical -- believe what God says. God says you are fearfully and wonderfully made, you have purposes on this earth that only you can complete. You are gifted. You are loved. You are able to do all things through Christ.” Yes, I have HUGE faith for others but for myself, I struggle. I beat myself up. It’s time for my identity to line up with what Jesus says about me. It’s time for me to truly live the resurrected life Jesus so dearly paid for. There is nothing past or present that I have thought, done, or been that can keep Jesus from using me for His purposes. The only thing that keeps Him from using me completely is my own belief in lies. And so I journal. I journal to take truth and put it into my own language. That of visual art. The starting point for all of us may be to go back into memory lane as Valerie did on Day 2 of You are Beautiful. I highlighted every “I remember” she wrote. Each highlight brought tears to my eyes. For her, for me, and for every kid and adult who lies were spoken over. Think back, call those lies out and ask God to give you truth in it’s place. Warning---this is not for the faint of heart nor is it a one time prayer (and if it is may I say you are so very blessed). Calling those lies out is a declaration of battle and a commitment that every time a lie pops into your mind and heart, you call it a lie and replace it with truth. I knew that the key piece in my journaling would be the “left overs” from my RISEN journaling page in Matthew 28 that I blogged about over Easter. I added the “I AM” stamp from the kit to my page. Highlighted who God says I am and the truth that He has written every single day for me -- in other words, nothing is a surprise and nothing is wasted. Added lots of enamel hearts, well, because He loves me (that’s hard for me to say guys because I often feel so unlovable) and scribbled in my own handwriting the truths that I thought He wanted me to weave into my soul. A bit of washi tape and the awesome tab “changed’ from the kit. I chose changed because He is changing me! Yes, at age 50, He is changing me and telling me to fly. He is asking me to see in myself what I have passionately tried my whole Christian life to sew into others. Fly my friends. You are loved so very much. Who doesn’t want to illustrate the ultimate victory over death, over sin? There is no greater place in history. No better example of what looked like the end being the beginning of true life and freedom. God always has a plan, period. God is always working. He works everything for our good. We can never look at things, events, even ourselves, the way the world does. In God's economy, death of one thing brings life and wings to a new and greater path. This is His way. I am so grateful. It's where the hope of my heart dwells. I started by printing and cutting out the printables. Added a bit of my own art. I have been working through Daniel Donaldson’s All Creatures Lovely and Small Workshop and I just love, love her ideas with watercolor squares. You will be seeing lots of these in the future. Anyway, I punched out a butterfly. A symbol of new life, freedom, victory and beauty in Christ. I laid out my pieces on the page. I chose to illustrate in Matthew 28. I had my Illustrated Faith Bible mat sitting out and decided to trace the random crosses onto my page. I added additional texture with Gina Lideros’ stamp and gold highlights using my gel pen. I adhered the printables on the page and then I made a “mistake.” I scribbled around the images. I normally like the imperfect look of scribbles but I didn’t like how is made the Risen seem fuzzy. Mistakes and disappointments are always an opportunity to learn! Perfection is NOT the goal. Worship and spending time dwelling in His Word is. Breathe. Focus on Him. Enter gel pens. The introduction of color to the scribbles reminds me of constant movement toward beauty, toward victory. Continuing lesson for me.... "If you don't like something, push through, learn, and embrace His plan." A finished journaling page is more than an illustration to me. It represents a journey. And every page in this precious Bible is a visual and tactile adventure and reminder of Him and of His voice speaking over me. It reminds me daily that I am on His journey and I am never alone. It reminds me, just as the butterfly does…to not despair, to not give up. It reminds me to focus on the hope of His ultimate victory over all things that are not right. He wants His children to fly with the beautiful wings of resurrection and freedom and not remain wrapped in the cocoon of despair. Lord, help me not to despair when I see what I perceive as failure, death, and defeat. Help me to rejoice knowing you are working out your plan of victory and beauty in all things. Once I finished the initial layout, I realized I had designed exactly what I was going to put in my Illustrated Faith Praise Book - treasures and memories of Praise, Hope, Song, Faith, Prayers and Beauty. So what’s a girl to do once she has content categories, well... make tabs of course! And a page is really not complete for me without the white gel pen details so I sketched a few stitches around my hearts and outlined the word praise and “stitched” the bloom paper in on the bottom. A few beloved clips on top-- and the first page of my Praise Book is complete. Enjoy making your Praise Book your own and don’t be afraid to try new things -- God might just teach you something along the way! Affiliate links are links to help get you to supplies I use in my art or I think may be of interest to you. If you purchase any item through some of these links, I may receive a small commission on the purchase which helps me keep my blog up and running. Using these links does not affect the purchase price of the items. Seeds of Creative Grace is a participant in the Amazon Services LLC Associates Program, an affiliate advertising program designed to provide a means for sites to earn advertising fees by advertising and linking to Amazon. I hope you enjoy my recent post on Illustrated Faith! Be sure to check out all of my Creative Team Members Bible journaling pages as well. A few weekends ago I was humbled and blessed to assist Shanna Noel during an Illustrated Faith Workshop series at Whimsodoodle in St. Petersburg, Florida. I loved watching women beam as they unpacked their brand new Bibles ready for the first entry. They were so excited and filled with anticipation of what God was going to do. I loved listening to beloved sisters in Christ speak of how God is moving through their hearts as they Illustrate their faith. I treasured having the honor of looking at the well loved, fat, color-filled journaling Bibles with tags and ribbons streaming from the tops. I cheered as I listed to stories of Him confronting perfectionism and healing broken places in the souls of these beloved women of God. I adored guiding and encouraging women as they picked up a watercolor brush and stroked vibrant color on their pages and discovered new ways to illustrate in their Bibles. And at the end of each workshop, I had tears as these beautiful women stood up with their finished entries, eyes shining, rainbows spilling out from their pages, and hearts telling how God spoke to them as they illustrated. I saw God everywhere and I soaked in all that He was doing in these women’s lives. Oh, how He loves us and oh how He delights when we reach out to Him and spend time with Him creatively worshiping and growing in Him. He is doing such a beautiful and amazing work through Illustrated Faith and Shanna Noel. At the end of the last workshop, Shanna gave me a wonderful stamp. A stamp designed by fellow Creative Team Member, Jess Robyn. I knew I would use it to document the weekend. I want to remember how all of the women I met were created in His image with special gifts and how they shine for God. Here’s a peek into how I designed the page. I started with the In His Image stamp and found inspiration from a Color Box pad I had sitting on my art table. I decided to make the rainbow of colors I saw in all the women around the camera. I see and process everything in colors so this was perfect. Next, I used my watercolors to paint the rainbow into the areas I blocked out with my pencil. If you want to try watercolors, my best advice is to work slowly. Achieve saturation by building up layers of color and letting them dry in between. The picture below shows only the first layer of color. I worked on the camera next. I wanted it to be more dense and opaque so I grabbed a handful of colored pencils and watercolor pencils from my stash and colored in the camera. I laid out my Illustrated Faith Bella Blvd letter stickers on clear packaging to make sure I liked the design I had in my mind. The finishing touches included In His Image, adding a sticker from the Whatever is Lovely collection, and a butterfly punched out of watercolor scrap paper. I used Faber Castell Pitt Pens to underline the scripture. I love this page and will treasure my memories from the workshop forever. If Shanna comes to a town near you, be sure to sign up! You will leave with pages of beauty and hearts full of God. But the fruit of the Spirit is love, joy, peace, patience, kindness, goodness, faithfulness, gentleness, self control; against such things there is no law. I love how each time you read scripture, He tucks a new vision or truth inside. Scripture is truly multifaceted, alive and active, ready to speak a new truth into every moment. So I was not surprised when I read this passage a few days ago and God blessed me with a fresh message - a “focus others” message and then He put a picture in my heart to journal. A picture of a garden. A garden we need to let grow. A garden for all to see and enjoy! When we bloom in the fruit of the Spirit individually, we make a glorious garden as the body of Christ. Our colors and fragrances compliment each other. We wind around each other supporting and growing together to His glory. When we lean into Jesus and extend the fruits of the spirit toward each other, God blesses us with collective beauty that we could not achieve of our own accord. We stand out against hate, discontent, stress, impatience, mean spiritedness, ugliness, unfaithfulness, rudeness, gluttony, self-focus, pride, and comparison. Our fragrance is strong and appealing and we blend together in a unique and beautiful way. I especially love that our Master Gardener selects the blooms and branches that are completely different. Some tall and graceful, some small and powerful. Some creative and some intellectual. Some quiet and some verbally gifted. Some blessed with faith and some chosen to sort out theology. Some who can sing and some who can listen. Some who can move quickly and some who move with caution. Some who can heal and some who can pray. Some with humor and some who know when it is best to be serious. We have different skin, different backgrounds, different strengths and weaknesses. We have all been given different gifts, and we are all His. How beautiful is His garden! We are His flowers, chosen for the garden soil of our lives. We are intentionally planted close to those who He has selected for us to bloom with. But in order to bloom, we have to embrace our differences and lean into His Spirit. We must draw on His fruit, extending kindness, grace, and goodness to those around us even when they are so very different...even when they push our buttons and brush up against our tender places. When we do this, we become more beautiful and so do those He has planted next to us. Oh what a beautiful call to be part of His garden, I want to grow and bloom and I want to encourage others planted around me to do the same. But I can’t do that in the flesh. I need to lean into Him and into the fruit of His Spirit. When we do that, oh my what a beautiful garden we create! Here’s a peek into the makings of this page. I started with a light pencil sketch of the flowers I wanted to include. Then I added layers of watercolor. I kept layering until I was satisfied with the depth and saturation of the flowers. I wanted the vibrancy of the blooms to pop off the pages. Then I added back some white highlights with my Signo gel pen. This probably one of my favorite things to do! I staged the Illustrated Faith Bella Blvd lettering on a clear sheet of packaging and laid it on top of my design to make sure I liked it. Sketching out the hand lettering on the top is always a bit nerve racking for me. I have to remind myself of the purpose of the page and that perfection is not the goal! Now, the finishing touches. I cut apart a strip from the Whatever is Lovely sticker sheet for my tab, added Bella Blvd’s tiny text in black, and a lovely green Bella Blvd enamel dot. I think the tab looks a bit like a garden gate! Praying that we all find joy where He has planted us and that we purpose together to let His garden grow! Be sure to check out all the inspiration on Illustrated Faith's new website! A long time ago, my husband helped a company that made shirts. As a thank you for all of his efforts, we were gifted some t-shirts. Among the pile was one of my all time favorites. It was printed for a mission trip to Africa and it said “You Have One Life, Use It.” The shirt reminded me how powerful one life was and made me realize how important it is that I choose wisely how to spend mine. I wore the t-shirt for years and now my daughter has it at college. Note: that is how much I love the girl, I let her steal my shirts! As I have been journeying through Illustrated Faith’s Make it Count devotional by Maggie Massey, I knew I wanted to put the stamp “Make it Count” somewhere in my Bible. The quote from the t-shirt always has always been on the forefront of my heart so I combined “You Have One Life” with “Make it Count” and searched scripture to see what page might have the blessing of these pivotal words. In Deuteronomy 30, God tells us He sets before us ONE life. That’s it. That’s all we get. And with that ONE life, we must choose. Perfect spot. I gathered my supplies and laid out my words on clear plastic packaging. I added my Illustrated Faith Transformed stamp set to the mix because I adore butterflies. Flowers, butterflies and owls…..favs. Anyway, butterflies represent life to me. I noticed that there is a new set of Bella Blvd Illustrated Faith butterflies coming out in February. These would be awesome as well. One of my life messages is that even when our lives are as ugly as a caterpillar, we need to keep in mind there is always butterfly, hidden, just waiting to spread it’s wings. I love that God sees the butterfly in me and that He has given me eyes to see the butterfly in others. I stamped my images onto the page prepped with clear gesso. I always prep my pages because I like the surface and it lets me follow my creative path no matter where it takes me! Next up, add some color. My favorite go to is watercolors. Now, I have been working with watercolors for many years and I have a significant stash. I have listed two of my favorite sets below but any watercolors will do. I often use and mix colors from many different sets. Use what you have. I added the words I laid out on clear plastic to my page and continued adding layers of watercolor to the design. I used my Bella Blvd Illustrated Faith pen to sharpen any stamped areas and my White Signo Gel pen to add highlights. The butterflies were also embellished with an aqua gel pen. Let’s make our ONE life count and remember He sees the butterfly! See you next time, happy Bible journaling! So...As family, it’s safe for me to share a bit of my heart journey, right? As with most things I attempt, I pray, I study, I read, I research LOTS; I illustrate it, I plaster it everywhere in letters and pictures, and... I set my mind to follow through. Turns out “courage” just means doing things even when you are afraid. It means pushing through fear and telling “fear” that it has no power over you, because you are going to do it anyway. Well, I did lots and lots of things scared in 2015. I stepped out with my art on social media, I applied for the position on the Illustrated Faith Creative Team, I forgave, I loved boldly even when everything around me told me to be safe, and I started a website to share my creative heart. Fast forward to this year and I think I am going to keep my 2015 word, COURAGE. I still get scared but I am going to continue to choose courage and tell fear it’s not ever going to rule me again. I want to be fierce when God asks me to step out for Him. Hmm… ok. “Well”...I said to Him, “Are you sure? Cause I like to pray and I have been a prayer warrior on and off for many years.” I tried to reason with Him. “Maybe I didn’t hear You, don’t you want me to do something different, something new.” “Prayer” kept resonating in my mind and soul. So I said, yes to this new word, and I asked Him to show me how to walk out PRAYER. I can lift up all the broken, messy places I see and I can ask Him to come. I can pray and speak truth in the place of lies. I can pray for light to flood the dark. I can ask for Him to work, to untangle the messes, to heal, to make beauty. Join me, be courageous, follow His lead, listen for that still small voice. I have an ever-growing list of scriptures I want to illustrate. However, for my last Illustrated post of 2015, I dug back to a post I started creating and writing in October. I love how God seems to delay things so that they are timed perfectly. Even when we feel late, He has a reason. He is always on time! I began working on the post this fall by asking my daughter what her favorite verse was. She whipped out her phone (because where else would an 18 year old keep her precious stuff) and tucked in her list was Psalm 62:8. It captured my heart and I began creating and writing. This Christmas felt like a storm to me. Usually, I feel a cloak of protection during Advent. A safe warm place of provision from which I can give others what they need. In years past, I have been the one feeding those who needed food, praying for those who needed faith and hope, speaking truth over every situation, supplying gifts to those who didn’t have the capacity to put treasures under their tree, and loving those who feel unloved. I always seemed to have an endless supply of energy, time, and provision. This year was different. It was more like a storm. A messy, endless storm. I had to fight to keep my eyes on Jesus every day. I felt empty and needy and incapable of “giving” anything of value. Everywhere I looked there seemed to be messes, impossibilities, sin, and pain. I had to remind myself daily WHO was in the midst of it all and WHO was the solution. And guess what, the solution wasn’t me! HE is the Refuge. My only job is to pour out my own messy, needy heart to Him. To trust Him with it all and let Him guide any steps I need to make. If He wants me to move, He will give me what I need. If not, I remain still, waiting and trusting. I don’t think the messy stuff is over yet but I can tell you I have grown. Messes are hard but God is bigger and He won’t waste a thing, not one tear, not one breaking heart. He won’t let go of His children and He will use it all. When we are empty, He is enough. Enough for us and enough for everyone else. Now, let’s illustrate. Here’s a bit of my process. I always start with a color scheme. Sometimes my theme comes from a pretty paper I love or one of my color swatch watercolor squares. This time I started with a color swatch square I made. I also knew I wanted to use the word “refuge” in Bella Blvd Illustrated Faith’s Whatever is Lovely collection. I added other elements from my stash and prepared my page with Dina Wakely’s Media Clear Gesso. I placed two clear sheet protectors behind my pages to protect the pages around my design. I discovered the awesomeness of these sheet protectors when I was teaching a class and needed enough protective pages for all the students. I searched my supply closet for something inexpensive that I could give to the students, and voila, heavy duty sheet protectors! After I had the flowers in place, I put a clean sheet protector on top of the page to help me lay out my letters. Once I achieved a layout I liked, I transferred the letters to the Bible page. The “our” is cut out from some scrapbook paper with my Sizzix Big shot die cut machine. I used my tab punch and some scrapbook paper to make the tab and added “true” from Illustrated Faith’s Whatever is Lovely Collection. I also added washi tape to the edges of my page and outlined my letters with Bella Blvd’s Illustrated Faith pen. So much truth and power tucked into such a short verse. When our world rocks and our hearts feel like they are about to break into a thousand pieces, we have a place to turn and pour out everything that is happening. God not only listens when we cry out to Him, He becomes the safe refuge where we can rest our emotions and breaking hearts. He doesn’t shake his finger at us and tell us we are being overly emotional, messy, or dramatic, He just listens, tells us to rest in Him, and focus on truth. God is not afraid of messes. He’s always got us and He is always ready and willing to be the refuge from any storm or any heartbreak. We just need to trust Him, turn to Him, pour out our hearts, and then let go knowing He’s got it. How awesome is that. We are never, ever alone. We always have a safe place to run. He is our Refuge. Hello friends! Welcome back. Here's another post I shared on the Illustrated Faith blog today. I just love the Make Room advent devotional? These women are touching my heart. I thought I might walk you through a bit of my journaling process. It’s no secret I love vivid color and illustration. Both help me remember truth. Sometimes I am very detailed in my illustrations and they take me a long time to think out and complete. Other times, I love to use stamps and stickers with quick swipes of color and simple illustration. There is no right or wrong and the process of learning is the fun part if you don’t stress about perfection and meeting someone else’s expectations. The important part is spending time with the Lord dwelling in His truth and moving that truth into your heart through creative expression. During the third week of advent we look at accepting. A few quick stamps with the Illustrated Faith Advent set, quick lettering, and brushes of watercolor over the words that I want to remember finish this page. In Day Two Anne Summers walks us into a perfect picture of acceptance. Anne writes “Beginnings demand breaking.” Yikes! Right at that moment I knew I was in for some truth. I continued reading and used watercolors to highlight the areas that spoke to me personally. After going back and reading again and letting things soak in, I went back and underlined the key passages that jumped off the page and did a dance in my heart. I added some scallop detail and white dots with my gel pen. Lord, help me be more like Mary! After doodling a few Christmas branches and stamping my favorite bird ever (from the Advent set), I decided this needed to go in my Bible. I kept the basic ideas of my original doodling and stamping and transferred them to the passage in Luke. I did use colored pencils and gel pens in the Bible illustration because I wasn’t getting the color I wanted with my watercolors but basically it’s the same ideas transferred. It’s also very important to me to add where I got the words from so I added Anne Summers’ name and the Make Room Advent information on the left side. I finished the page off with one of my favorite Elaine Davis’ printables as a tab. And there you have it. If you are just getting started Bible Journaling, I would encourage you to quiet your heart and mind and let God show you something new! Doodle, document, add some color, simple lettering or stickers and you will find that He changes your heart and mind in the process. I am spending time in several Advent readings this year but I continue to adore the NapTime Diaries Make Room for Advent Book. I love Advent. God is just waiting for us to spend time with Him. His arms are open with gifts of renovation. I want God to make over my heart. I want to be more like Jesus this Christmas. At the end of week one, Make Room Crystal Shine grabbed a hold of my spinning mind and reminded me to examine what I am holding on to. Because as a daughter of the King, I need to be careful what I hold on to. What I hold on to takes up space, precious space. I need to make sure what I am holding on to is God’s choices for me and if they are not His purpose for me, I need to let go. I need to Exhale. So what exactly do we need to Exhale? Certainly, we need to let go of those things that God clearly tells us not to hold onto such as fear, unforgiveness, pride, frustration, and doubt just to name a few. Those things take the place of truth in our hearts and minds. They need to be called what they are and given into His hands. After we let go, we need to overwrite those places with confidence, forgiveness, humility, peace, and trust. We surely need to hold onto truth and Exhale lies and sin. When we let go of good things, we make room for great things. Now there is a concept I will always need to work on. It’s that darn Martha part of me that thinks if it needs to be done and it is good, aligning with His character, I should do it. I should say yes. Because we are called to serve and if there is need, as the body of Christ we should fulfill it, right? We each have purposes that He laid out for us since the beginning of time. If we are using our energies and talents focused on things He has not asked us to do, how will we ever have the capacity to do what He really designed us to do? But you say, there’s all these people I will let down. Enter again, Martha who wants to please the people in her life, Martha feels responsible for the peace and wellbeing of those around her. Well, quite frankly, their well being is God’s responsibility not ours. We may play a part but the bottom line does not end with us. God is always working and loves those around us more than we do. And lastly what about the precious ones He has really chosen to do those good things we are doing, well they can’t exactly do them if we are taking their place can they? Yikes! We need to get out of the way! Jesus challenged Simon, James, and John to choose the greater purpose in Luke 5 when He got in one of their fishing boats and told them, change of plans, this is good, but I have something greater for you to do. You are going to be fishers of men. We need to pray and ask God to be clear with us just like He was with Simon, James, and John in Luke 5. We need to know what He wants us to hold onto, and then we need to be obedient and courageous, and... Exhale. Yep, I will be working on this probably until I leave this earth. But I am thankful for this Advent reminder and encouragement to walk out what is the greater. Greetings! I pray that you are all well and enjoying the first day Advent. I have to admit I jumped a bit ahead. The Make Room advent book from Naptime Diaries has been waiting for me to peek in since October! Advent is just my favorite season. It’s a time to really look at your heart and prepare room for the biggest celebration of all -- the birth of Christ! Well, I peeked in and, smack! The first thing I find is a reminder that my heart is, well, messy and my priorities are mixed up. I spend too much time on the to-do lists of life, tidying my home being one of them, and too little time letting God bless my heart and mind with His healing order and truth. Becky Keife points to the story in Luke 10:38-42. In the story, Jesus visits the home of two sisters, Mary and Martha. When Jesus arrived, Mary wanted to spend all of her time sitting at His feet, absorbing, listening, and resting in His presence. Martha, on the other hand, was focused on serving and was busy preparing and working. Frankly, Mary ticked Martha off. Martha wanted help! She wanted Mary to pay attention to the to do list! You know what Jesus said when she complained, “Mary has chosen the right thing.” Basically, leave her alone. I prepped my page with clear gesso and used a clear page protector to keep it from going onto the pages behind. Once dry, I taped the page to the clear sheet to keep the edges from curling while I worked. I started with the ideas God gave me and sketched them loosely on a pad of paper. I wanted a graphic, simple message without illustration. After sketching a draft, I collected the supplies and began to lay out the lettering on a clear sheet. I love the Bella Blvd sticker sheets. They come in yummy colors and have just the right thickness. I added some black block letters from my stash. I didn’t have all the right upper and lower case letters from one sheet so I mixed them up. I liked the contrast and the “messy” feeling it produced. I love how God works His message in even more completely when we use what He provides. I cut out a heart from my favorite Geli Plate handcrafted paper. Once I had the basic design of the sticker lettering, I added the handwritten script words. I added washi tape to the edges of my pages. I do this so that I can easily find pages that I have illustrated and I like the color it adds. Lastly, I highlighted the story of Mary and Martha, added the author of the quote and Advent 2015. Determine with me to prioritize God and spending time with him this Advent. Let’s let Him “tidy” our hearts so we have more room for Jesus. 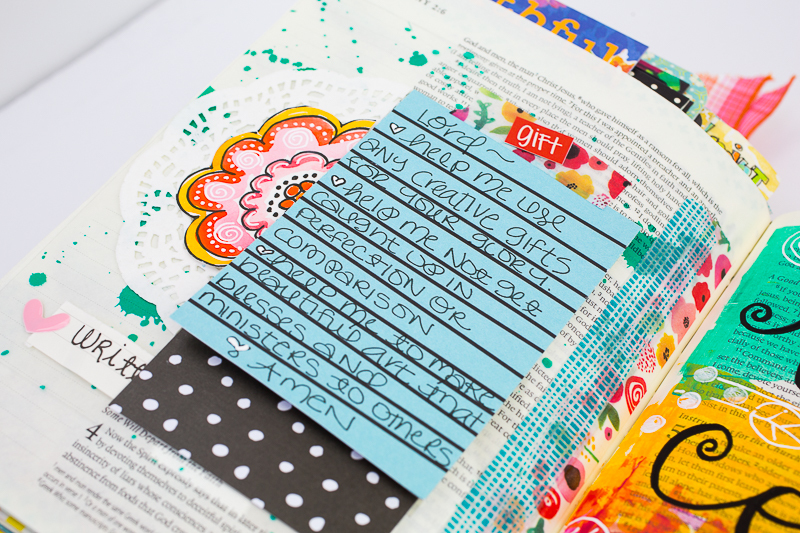 One of my gifts during Illustrated Faith's #gratitudedocumented was a new look at the scripture for JOY. (2) Consider it wholly joyful, my brethren, whenever you are enveloped in or encounter trials of any sort or fall into various temptations. (3) Be assured and understand that the trial and proving of your faith bring out endurance and steadfastness and patience. (4) But let endurance and steadfastness and patience have full play and do a thorough work, so that you may be [people] perfectly and fully developed [with no defects], lacking in nothing. I have read this scripture probably a hundred times. I understand it in my head and have submitted my heart to God and asked Him to empower me to walk it out; but I miss the mark most of the time. I am serious when times are serious. I have been given the gift of faith and I am a warrior with hyperfocus. But Quite frankly, when it comes to joy and times are hard, I become a porcupine. My quills are extended in defense of any motion that might knock me off balance and keep my focus from truth. There just isn’t room for joy. It can’t even get near me! Well, obviously this is far from God’s will because He clearly says, count it ALL joy! Joy! Oh my! Porcupines aren’t joyful! They are prickly and hard to get near. They are operating in fright and defense as if they don’t have any method of remaining safe except their sharp quills. As a children of God, we can be grateful that we are NOT dependent on ourselves for eternal safety. We don’t have to extend our quills in defense. In fact, they won’t do us much good anyway. We can trust our hearts and loved ones to our Lord who promises us endurance, steadfast faith, and patience as a fruit of any battle. He promises to complete us so that we are lacking nothing! Therein, my dear friends, is the JOY. It’s up to Him. Our hope is in Him. And He can do all things! My quills should be shouting and spitting rays of JOY that I will never be alone. He will always be my defense and stronghold, and He will complete any work He begins in me (Psalm 57:2 and Philippians 1:6). No trial, temptation, or storm will be without purpose. I can count it all JOY. I’m praying God will help me to continue to move toward this truth and to walk it out fully. I am grateful that He hears my prayer and knows my heart. One day, I will be walking without my quills extended. I will be walking in JOY. I think I am a little closer already. I have had many requests to do a process post about how I put together my Documented Faith journal each week. It was a cloudy dark day when I took many of these pictures so some aren’t up to my standards but I thought I would give it a shot anyway. Please be kind and bear with me as I learn to do posts of this nature. I have tried to find most of the supplies for you in case you want to duplicate or fall in love with something in particular. Most of my layouts can be altered to suit the supplies you have on hand. I am a firm believer in God showing up BIG when we dig through what we have. Also, please note the links to supplies at Amazon are affiliate links. That is...if I figured out how to do that properly! This week I started with a polka dot navy washi tape from Michaels and the beautiful paper you see on the right hand side of the planner. I cut the theme paper 5 x 8 inches, rounded the corners, and glued it down, adding polka dot washi tape over the edge. The washi tape on the left side was already in place from the prior week. 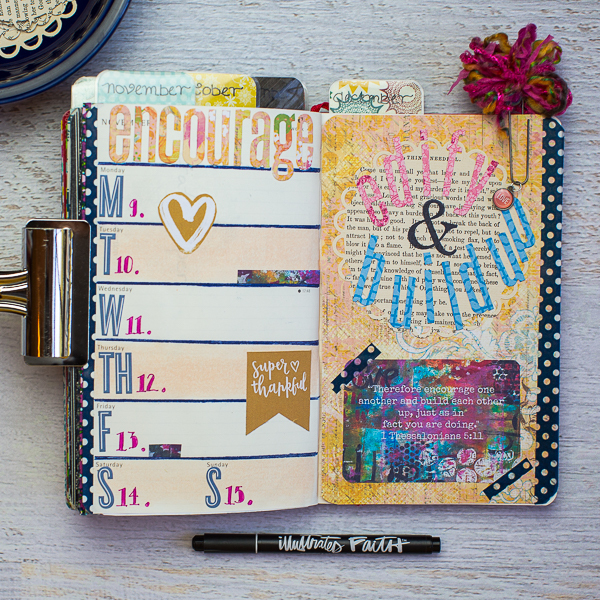 I decided to use my Sizzix Big Shot and Tim Holtz Alterations die (listed below) to cut the focus word, “encourage” for the month out. I used Daily Flash Deep Sea “Shop Front” stickers from October Afternoon for the days of the week. I love to pull out one of the colors in the layout and watercolor ever other day with a light wash. I use very little water in my brush and load it with the custom color I mixed to match the paper. Watercolor does very well when the page has been reinforced on the opposite side with paper glued down (for example next week’s layout will be on the opposite site of the beautiful paper this week). To finish the week off, I used Prismacolor Premier pencil in Indanthrone blue to make the lines in between. I decided to cut “edify” and “build up” out of papers that coordinated with the scripture card Stephanie provided for us. I used the same Alterations die (listed below) I used for the word “encourage.” and glued the words on top of a die cut from an old book and stamped “&” in the middle. After that I trimmed down Stephanie's scripture card, rounded the corners, and adhered it with washi tape. I still needed the days of the week on the calendar side. I ended up hand drawing number with a fine point pen and coloring them in with a Prismacolor Premier colored pencil in Process Red. I added a few fun printables that I cut out from Illustrated Faith and the scraps from trimming the scripture card. I like to have fun prompts and bits of color scattered through the week. And there you have it, the creating process for me is very organic. Sometimes, I love what I finish and sometimes I learn new things. It's always good. I learn by making mistakes and trying new things. Throughout the week, the journal sits next to my area where I do devotions and I jot down significant events or scriptures I feel God is speaking to me that day. It has been such a gift to see this planner grow into such a fat little book filled with testimony, memories, and God’s faithfulness. May He bless your creativity this week! Yes! It's true! I have joined the Illustrated Faith Creative Team! I am so excited to be a part of Illustrated Faith and to work with these beautiful and crazy talented ladies! Almost everything I create relates back to my faith. Last Christmas, God drew me into the world of illustration in my Bible. I now have two journaling Bibles: one is illustrations and hand lettering and the other is my mixed media Bible. It took me a while to have the courage to use mixed media techniques in my Bible but I think I love spending time with God in this Bible the most. There are less rules and there is less pressure that I might make a mistake -- stickers, stamps, and beautiful papers make it even more fun. The key for me is to worship God in the midst of dwelling in the passage and let Him move the art supplies and techniques around the page. I am humbled and honored to be a part of Illustrated Faith. I believe He loves when His children spend time in His Word through artistic expression. When you meditate on a passage visually and kinesthetically, the truth is embedded into your heart in ways that could not happen from reading or memorizing words. 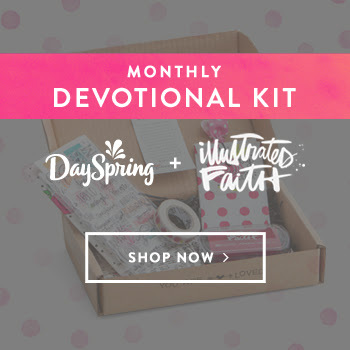 Visit the Illustrated Faith site and be inspired with me! There is a stirring in my heart to share, to grow, to contribute, and to communicate some of the lessons of grace I have experienced through returning to my first love: that of creating and living out life with a creative soul. God places seeds of His design deep into the fabric of every person’s soul. He plants these truths and purposes into our hearts and minds and graces us with gifts so we are equipped for the journey. We are designed to bring Him glory through these seeds. Sometimes, these tiny treasures grow and flourish right from the start. Other times, I think they have to stay in the darkness for a time, maybe even die, before they grow and bear fruit. God planted seeds of creative grace into my soul before I was born. Growing up I LOVED the simple act of creating. I would design houses complete with handcrafted color schemes and accents. I delighted in moving the small furniture pieces around and making different settings and details. I made every accessory you could think of for imaginary play and was constantly rearranging or tidying everything in our home to make it more “beautiful.” I made mud pottery and cities of sticks and leaves. I would beg my mom to let me get out the “good” linens and china so I could set a pretty table. I stacked and restacked my beloved father’s books so that he would have a pleasing place to study his medical journals or read the paper. I loved art classes. I still remember those beautiful teachers who taught me to love the very smell of an art room. One of my greatest childhood treasures was a big laundry tub of broken crayola crayons that we kept in the basement. My heart and mind came alive when I created, but there was very little encouragement for this passion. There were a few art teachers who saw something in me and tried to encourage me; but quite simply, I chose to believe the lies that it was a “nice hobby” but nothing more. And the seeds of creativity went into hiding, into darkness, and died. In my 30’s, life changed. The Lord grabbed hold of me and began speaking truth over me. He sent a beautiful sparkling-eyed female artist into my life named Donna. She was a creator, a painter, always changing things, making things more beautiful, experimenting and drawing others into her creative world. We spoke the same language...one I hadn’t heard in years. Donna encouraged me and kept telling me I should paint. We met in my kitchen, turned on some beautiful music, and let our paint brushes move across the canvas. I painted a church with flowing hills. It was the beginning. And the seeds that God placed inside my heart started to feel the flow of hydration and the warmth of truth. They began to move up through the dark soil. Many years have passed since then. I am almost 50 now. The seeds of creativity are pushing through the darkness of fear and doubt. They are growing and beginning to flower and bear fruit. Now, I don’t just create because I love it. I create because I must. It is a hunger to walk out the journey God has laid out for me. I don’t have a blueprint of his plans, but I have faith, and He is teaching me to be courageous. I am learning, learning to be obedient to who God designed me to be. My prayer and hope is that this blog will be a place of grace where the seeds of creativity can be fed, encouragement can be found, and love and truth can be expressed through beauty.